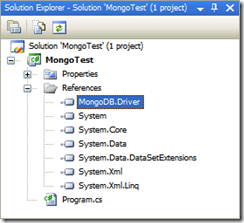 Last week we looked at accessing MongoDB using the C# driver. This week we will look at accessing it using Linq. If you followed the instructions for last weeks post, you already have everything you need to get up and running. So lets just jump right in. 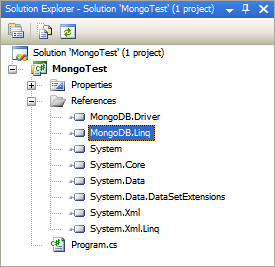 To access the Linq functionality of the MongoDB C# driver, you need to add a reference to the MongoDB.Linq.dll which comes in the distribution with the C# driver. Simply add a reference to it. Next we want to replace the query code from last week with the Linq query code. So find the following code in last week’s Program.cs file. // Create a specification to query the orders collection. // Query the orders collection. where doc.Key( "customerName" ) == "Elmer Fudd"
The IMongoCollection interface exposes the AsQueryable() method which gives you access to all the Linq goodness. I realize this was a very short post this week, but that is more a testament to the ease of use than to the laziness of the blogger. Next week we’ll dig deeper into querying the db. Last week we looked at setting up a MongoDB instance, and working with it through the Mongo shell. This week, we look at accessing it through the C# driver. There are several .NET drivers available for MongoDB. You can check out the list here. 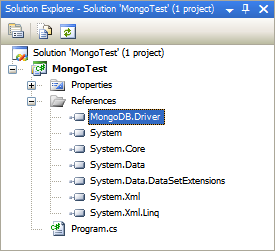 I chose to use the mongodb-csharp driver. It seems to to have the widest feature set, and the most support. To use it, you can either build it from the source, or download the binaries directly here. To use the driver, simply create a new project and add a reference to it. For our sample, create a new console application. Then right click on references, choose add reference, and find the MongoDB.Driver.dll and add it. After adding the reference we are ready to write code. 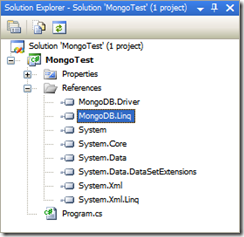 Here is a very simple snippet of code to test out Mongo. This is the full content of Program.cs. // Connect to the mongo instance. // Use the myorders database. // Get the orders collection. // Create a new order. // Add the new order to the mongo orders colleciton. The comments should explain most of what is happening. One thing worthy of note is the Document class. The Document class is much like a dictionary. Remember that MongoDB does not have a static schema. Therefore a dictionary serves the purpose well since it is dynamic by nature. There are other drivers (such as NoRM) out there that will map a static C# class into MongoDB much like NHibernate or another ORM, however, then you lose some of the benefit of the dynamic schema, however, depending on your needs, this may be acceptable. Note that to use this, you need to have the instance of MongoDB up and running. You can follow the instructions from last week’s post to get it installed. If its already installed, just open a command prompt, go to the bin folder in the install directory (in my case C:\mongodb\bin), and execute the command mogod. Now you are ready to run the application. Doing so gives the following output. Next week we’ll either dive a bit deeper into the driver’s api, or look at the autosharding capabilities of MongoDB. Not sure which yet. See you then! Lately, I have been looking into MongoDB and other alternatives to traditional relational databases. MongoDB seems to be the best fit for the kinds of scenarios I am working with here at BancVue. Because there is little querying, but large amounts of inserts, they need to be fast. The consolidated dataset can get very large. Therefore we need a system that can handle massive amounts of data. Because we need to house so much data, it requires us to scale to multiple machines. Ideally, the system would easily scale to multiple machines as needed (something SQL-based databases don’t do very well). Since we do have a need to query the database to get the data out, it would be nice if the system could parallelize the queries so they would be more performant when scaled out. I hate the thought of working on something that takes a UNIX guru to set up (because I am not that guru), and I don’t have a whole heck of a lot of time to devote to learning a new system at the moment. MongoDB fulfills all these needs. It has a very fast insert speed, can scale to thousands of machines, can automatically shard the data across those machines to store large volumes of data, and run map/reduce queries in parallel across those machines to produce results. Not to mention that it is easier to get running than any db I have ever used. Download the binaries and extract them. Create a folder for the data. (C:\data\db or /data/db depending on OS). Execute mongod.exe in the extracted bin folder. Now you have a running instance of MongoDB! MongoDB comes with its own interactive shell. Run mongo.exe from the extracted bin folder to start it up. It will automatically connect to the instance we started up on our local box. (You can use command line args to connect to instances on other machines of course). From here, you can interactively execute commands against the database. The show dbs command will display a list of all the databases on this server. This is the list of all the databases in your mongo server. To switch to another database you use the use command just like in SQL. Notice that you may pass a new database name to the use command and it will work. Actually, MongoDB will not create the database until you actually insert something. You can see this by executing show dbs again. The myorders database does not show in the list. MongoDB uses the concept of collections in the same way Sql uses tables. However, since MongoDB is a document database, it does not constrain all the objects in a collection to the same structure like tables do. Each object can have its own structure (or schema). Thus, MongoDB is called a “schema-less” database. Lets insert some data into a collection now. Where did the orders collection come from? It was created automatically by MongoDB. Likewise, the database was created at the same time. If you want to run show dbs again now, you will see the myorders database. Lets now look at what was inserted. First, we’ll look at all the records in the collection. We do this by calling the find() function on the collections with no arguments. You will notice the introduction of a new field called _id. This is an autogenerated id that serves as the primary key. You can override this key if you like, but that is beyond the scope of this test drive. Notice we got the same result…it found the one record. If you supply an object to the find method, it will search for all items that match all the fields provided. Well, I hope you found this test drive useful. Check out the documentation for more information. I am impressed with the ease of setup and use of MongoDB so far. Next time, we’ll look at accessing MongoDB through C#. Here is a C# implementation of a high performance message reader and writer that can read and write messages to any stream using Json.NET. We are using a similar implementation here at BancVue as our message store and it is performing quite well. I settled on Json.NET after trying several other serializers and reading a few posts on serialization performance. Objects serialized as Json are much smaller than Xml, and the Json.NET project seems to have the fastest serializer, and pretty wide support in the developer community. What I set out to create was something that can serialize millions of messages to a temporary holding place, then deserialize them for processing later. This serializer simply writes the Json to a file, but it could be used to write to any stream. There is a MessageWriter and a MessageReader. Together they can be used to form a “Message Store” as mentioned in some of Greg Young’s posts. Below is a unit test modeling how I want to use these objects. // Need to rewind to beginning of stream so we can read. Simply calling writer.WriteMessage() will write the message to the stream. Calling reader.ReadMessage() is all that is needed to read a message from the stream. I added Flush() to the writer so that when writing to files I can use a buffer. Calling flush simply calls flush on the underlying stream. Here are the interfaces for the writer and reader. Something to note… I am using WriteLine() to write each object. This separates them with a CRLF. I had to do this because Json.NET currently requires you to have only one root element…unless you want to deserialize all the root elements as an array. Since I have millions of messages, I can’t create an array of that size in memory or I will run out of RAM. Until this is fixed in Json.NET, I will just use the WriteLine mechanism. It has worked well so far. This setting tells the serializer to insert the type names of your objects into the Json itself. It then can use it when deserializing to determine what type to create. It does increase the size of your Json, but it makes it much easier to work with since you don’t have to know exactly what type of message you are deserializing. All in all, this serializer/deserializer set is very fast. We are using a similar implementation here at BancVue in our production environment and are very pleased with the results. Here is a test that shows a bit more about how we use the serializer when working with multiple messages. // Need to rewind to beginning of stream to read. I pulled my hair out for hours trying to figure out how to get WiX to generate an installer that pulled the target install directory from an existing environment variable. This is easy to do if the variable is one of the standard windows file locations like “Program Files” or “App Data”. However, if the environment variable is a custom one, its not so straightforward. To get it to work, I had to use a custom action to set the directory value. And if I wanted it to show up in the UI, I had to run the custom action in the InstallUISequence (not the InstallExecuteSequence). Below is the code that I ended up using to get it all to work. I hope this post helps you avoid wasting the time I did trying to solve this issue.